BRIDE, the leading wedding event in the Middle East in both size and influence, has confirmed the dates for its 13th exhibition in Abu Dhabi and 17th in Dubai. BRIDE Abu Dhabi will be hosted at the Abu Dhabi National Exhibition Centre from 12 – 15 February 2014 whilst BRIDE Dubai will be held at the Dubai International Convention and Exhibition Centre from 2 – 5 April 2014. BRIDE has raised the bar year-on-year by offering the perfect showcase of the latest bridal and fashion trends tailored around the modern bride, allowing exhibitors the opportunity to sell directly to visitors. Building on the success of the past shows, the 2014 editions will be marked by exclusive participation of a range of international fashion talent, affording visitors the only chance to acquire their designs in the UAE. With a packed schedule of high-octane fashion presentations, engaging activities and events, 2014 will be an exciting occasion to see, touch, feel, experience and buy. BRIDE will be complimented by Beyond Beauty Arabia, the only dedicated consumer beauty event in the region, which was launched in Abu Dhabi for the first time in 2013. BRIDE is delighted to announce that Beyond Beauty Arabia will also debut in Dubai in 2014. Both BRIDE and Beyond Beauty Arabia will be a one stop shop for brands to reach a vibrant and affluent demographic of discerning females who are well versed with the latest fashion, beauty and luxury products. 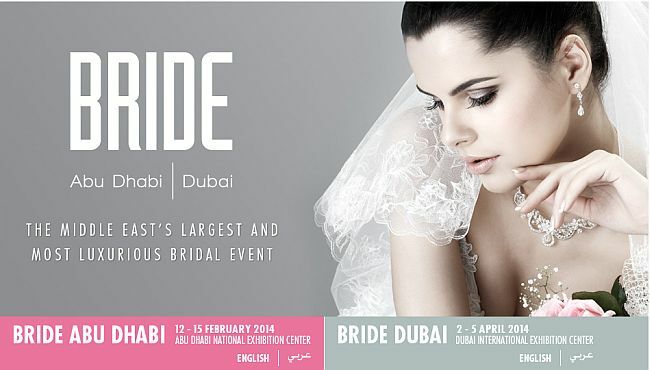 BRIDE in 2014 is celebrating its 13th edition in Abu Dhabi and the 17th edition in Dubai. BRIDE offers a unique showcase of the latest bridal and fashion trends, tailored around the needs of the modern bride from a wide range of nationalities. A visit to BRIDE is a chance to engage, explore and be entertained with a glittering line-up of fashion shows and on-site events. BRIDE is supplemented by Beyond Beauty Arabia, a specialist celebration of beauty trends and products that will be rolled out into Dubai following its successful launch in Abu Dhabi in 2013. BRIDE is managed by the INFORMA Exhibitions, and is the perfect platform for brands to reach an affluent demographic across the region. More details about BRIDE can be found at their website.